I received Pura d'or shampoo and conditioner in exchange for an honest review. As always, all opinions are my own. I switched up my hair color a little for the summer. The photo on my sidebar was taken last fall, but now I have light blond highlights in my naturally dark hair. Since my hair is naturally curly, I straighten it a few times a week. Blond + heat = serious damage. I knew I wasn't using the right shampoo and conditioner for my hair, so I was excited to review the Pura d'or products. Argan oil is one of my favorite oils for damaged hair. It's a dry oil, so it moisturizes without leaving your hair excessively oily. It's high in fatty acids and vitamin E, so it nourishes your hair without weighing it down. 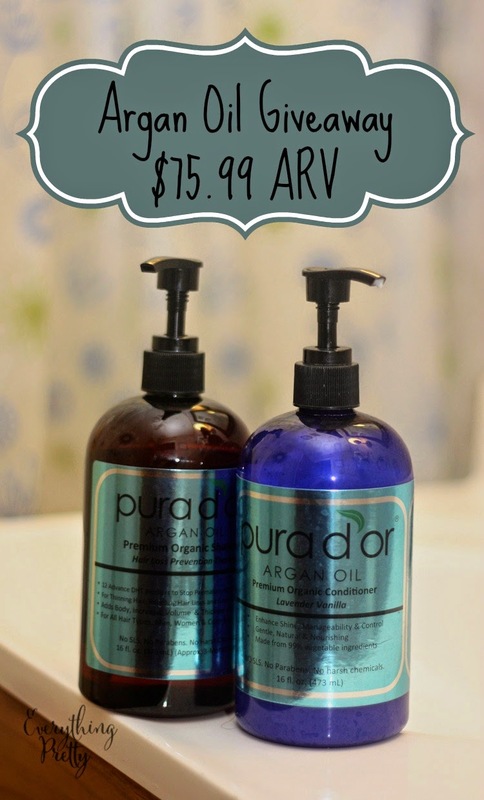 I got the chance to review Pura d'or Organic Argan Oil Based Hair Loss Prevention Shampoo and Argan Oil Based Conditioner in Lavender Vanilla. Both products are free of gluten, parabens, and SLS. The company is cruelty free and certified organic. SLS is what makes shampoo suds, but it can also be very drying for your hair. Curly hair can get really dry when you use a shampoo with SLS. Since this shampoo doesn't have SLS, it doesn't gets sudsy. This can take a few washes to get used to because, for me, it seems like I'm not getting all of my hair without the suds to let me know what's clean and what isn't. The shampoo is also very sticky, so it doesn't glide through your hair. I used three pumps of shampoo for my chin-length hair. The conditioner has a very nice, light scent. It is thick, so it covered my hair well. I used two pumps of conditioner, but I only condition the end of my hair and not the roots. I was pleasantly surprised that I noticed a difference in my hair after the first use. It was smoother, shinier, and a lot softer. I straightened it after I washed it, and it laid a lot flatter than it normally does. Want to try this shampoo and conditioner set plus a bottle of argan oil for yourself? Pura d'or is giving away one bottle of each product to 50 winners! Follow Pura d'or on Instagram for a chance to win. This is a $75.99 value. Good luck!